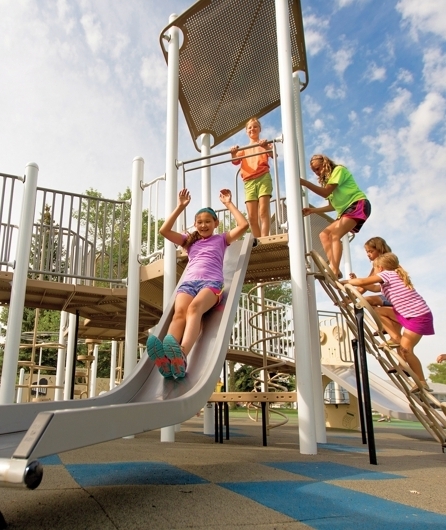 Can a playground transform a community? “Absolutely,” says parent and community volunteer Rohan Crown who helped bring an extraordinary new play space to an economically-disadvantaged community. Parts of the ageing wooden playground structure in his neighbourhood had had been condemned by the city so kids could no longer play on it. It had become an eyesore and a magnet for vandalism and loitering. Parents in the neighbourhood formed a committee and started planning. They wanted to create a stand-out play space that would make the community proud and improve their public image. While they were aiming for something showy and inspiring, they also needed a structure that would stand up to the demands of an inner-city setting and harsh climate conditions. Once we understood the group’s objectives, our team began finding creative strategies to meet those goals. Combining playground favourites with a stunning net structure in a sophisticated colour scheme, our designers created a show-stopping playground loaded with fun and thrills for all ages. On the practical side, we kept the design as transparent as possible in order to maximize visibility, prevent hiding spots and make it easier to supervise. Flat surfaces were kept to a minimum to discourage loitering, roofs were avoided and steel construction ensured long-term durability under tough conditions. Stainless steel slides deliver the utmost in thrills as well as durability. Curved lines and challenging upper body components appeal to older kids. Having fun is what it's all about! Asteroid net combined with an exciting play structure inspires outdoor play. Sophisticated design and a contemporary colour scheme make this design a stand-out.